US President Barack Obama has asked the Australian government to accept a group of Chinese Muslim detainees currently held at Guantanamo Bay prison camp. The Uighurs have been cleared for release by US courts. It is the first time Australia has been approached by the Obama administration over the Uighurs. Two requests by the Bush administration were turned down. China has requested the Uighurs' return, but the US will not send them there for fear they will be persecuted. President Barack Obama has said he intends to close the Guantanamo Bay prison by January 2010 and is considering what to do with its remaining 240 detainees. The 17 Uighurs held at the prison camp are among a group captured in Afghanistan in 2001, and cleared for release in 2004. Albania took in five of the ethnic Chinese group in 2006 but has been unwilling to take more. The Sydney Morning Herald reports that the request put to Australia by the Obama administration involves six of the remaining Uighur detainees. A spokesman for Australia's Foreign Minister Stephen Smith said the request would be considered "on a case by case basis and in accordance with the government's strict immigration and national security requirements". A US federal judge determined last year that the Uighurs should be freed, but the US has not found any country willing to take them. 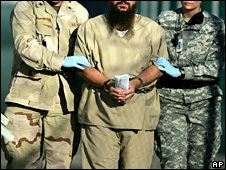 On Friday, the Obama administration filed papers with the US Supreme Court arguing that the men were being lawfully held even though they are no longer considered "enemy combatants". The Obama administration wants the Supreme Court to uphold an appeals court ruling last year that the men should not be released into the US. China warned in February this year that it strongly opposed any country accepting them. It wants to put the men on trial for alleged separatist activities and has said any country that takes them in would be harbouring terrorists. Many Muslim Uighurs from Xinjiang in western China want greater autonomy for the region and some want independence. Beijing has waged a campaign against what it calls their violent separatist activities.